If you don't have a dinner date or if you do, you should still make yourself presentable. Here's an outfit inspired for this occasion. Doesn't matter if you going out or just chilling in your house, this outfit will have you look sharp on a date, and comfortable in the house. For this outfit look, we decided to go with some color blend. Black and navy blue are an easy mixed and catch combo to use. 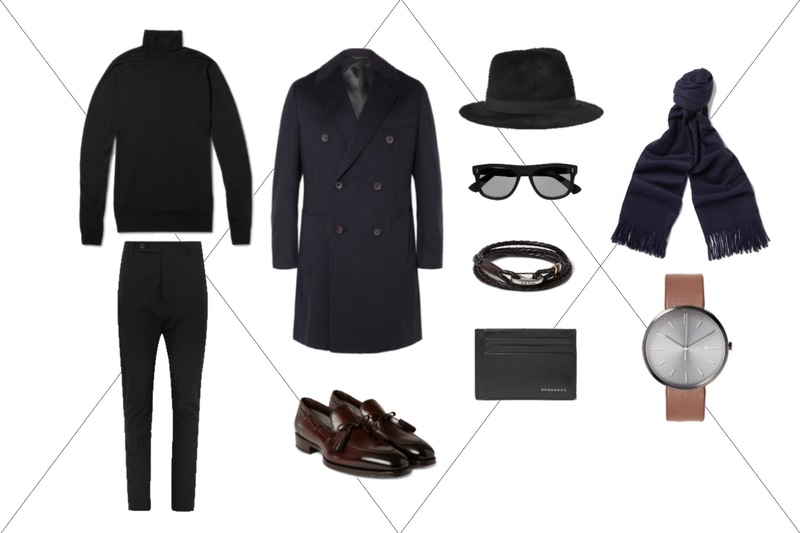 Here we decided to use a black turtle neck shirt by John Smedley, matched with a pair of black pants by Valentino. Since this look can be a bit too plain by far, is time to add some accessories. Here, we added a bracelet from Paul Smith Shoes & Accessories, along with a brown leather watch from Uniform Wares. These will add sharpness and elegance to this look. But if you want more elegance for this look, a simple brown leather loafers can do the job, like these from Tom Ford. Depending on the weather, here we also added a navy blue long coat by Thom Sweeney, to keep you warm during those cold temperatures. To make this look more fashionable, adding a fedora hat is an easy was to go with this look and don't forget you scarf and sunglasses if you're leaving to your date through the day. That's all for today, and we'll see you on our next post!